Show Me the Missing Documents! Why are US Documents about the Murder of Jesuit Priests Disappearing? Twenty-one years after the murder of six Jesuit priests, their house keeper and her daughter in El Salvador [November 16, 2009 posting], related documents released in a public collection by President Clinton in 1993 have been re-classified—and even disappeared. Two years ago, members of the human rights community filed a criminal case in the Spanish National Court against the 14 former Salvadoran military officers allegedly involved in the massacre. As a part of the evidence introduced to the court, the National Security Archive provided copies of declassified U.S. government documents and expert assistance in interpreting the documents. The 1993 Congressional Request for President Clinton to release the documents. 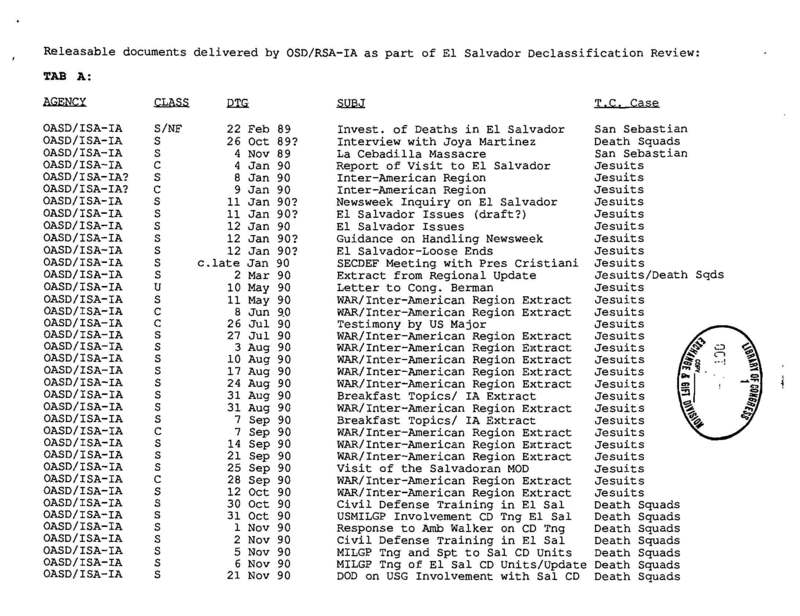 In effort to help Stanford Professor Terry Karl and National Security Archive Analyst Kate Doyle to provide expert witness testimony on the documents related to the massacre, Archive staff decided to revisit the original collection of the El Salvador Human Rights documents released by the U.S. The documents were released by President Clinton in November of 1993 and August of 1994 upon congressional request, following the March 15, 1993 release of the United Nation’s Truth Commission Investigation, From Madness to Hope: The 12-Year War in El Salvador. The special collection consists of documents from various U.S. government agencies including the Department of State (DOS), the Department of Defense (DOD), the Central Intelligence Agency (CIA), the Defense Intelligence Agency (DIA), and the U.S. Army. Many of these documents were included the National Security Archive collection, El Salvador: War, Peace, and Human Rights, 1980-1994. In September 2009, my colleague visited the National Archives and Records Administration (NARA) to do a preliminary review of the documents in the El Salvador human rights collection. I completed a follow-up visit where I more closely reviewed the documents and found that the collection included only the State Department documents from the collection, with the exception of a few folders labeled “Non-State.” The majority of the papers in the “Non-State” folder were actually “withdraw sheets.” (When a document is re-classified, it is removed from the file and replaced with a “withdraw” sheet which provides a small amount of identifying information, a tracking number and the date the document was re-classified). I worked with several archivists in the NARA reading room, and we were unable to locate the rest of the “Non-State” documents in the collection. The collection was supposed to include at least 939 CIA records, and 916 Department of Defense records. These were obviously missing. I consulted with National Security Archive Analyst Kate Doyle about the possible location of the remaining documents in the collection. She recalled an obscure collection of El Salvador documents in the Hispanic Reading Room of the Library of Congress. Upon visiting the Library of Congress and after receiving assistance from a very helpful staff member, I was able to find many of the missing Non-State documents, including several binders of a thousand or so pages of CIA and DIA documents. The collection at the Library of Congress had a finding aid that included reference to many other “Non-State” documents, including some from the National Security Agency (NSA), the Office of the Secretary of Defense, and the United States Southern Command (Army). These three sets, however, were not physically present in the Library of Congress. I asked the Hispanic Reading Room staff member and he said that they were not on the shelf, and they must have been lost. Lost? We decided to request all of the missing documents by filing various Mandatory Declassification Review (MDR) requests because we had the withdraw sheets from NARA, and the finding aid table of contents which listed the missing documents at the Library of Congress. There’s a paper trail…But no documents. On March 17, 2010, I returned to NARA to make copies of all of the withdraw sheets in the “Records relating to the United Nations Truth Commission compiled 1980 – 1993” collection, one of the two which I had previously reviewed in October 2009, and my colleague had previously reviewed in September 2009. I placed a request to see these documents, however my request was denied, saying that the documents were restricted. I explained to one of the archivists at NARA that I had seen these exact documents back in October, only a few months before. He looked in the system and said that there was no record of my pull slip for the documents (proof that I requested and received them in October), and that I had never seen them. I then produced a photograph I had taken of one of the “restricted” boxes back in October, again explained that yes, I had in fact seen the documents, and that I needed to see them again. After nearly an hour of “looking into it,” he came back with his supervisor and explained that it was a mistake, that I should have not seen the documents, they are restricted and that they would have to be re-reviewed before I could see them. He claimed that NARA must have “accidentally misplaced my pull slip”. Unfortunately I did not have physical proof (such as a photograph or copy of a pull slip) of my colleague seeing the documents in September 2009. As all U.S. archival researchers know, it’s highly unlikely that both my colleague and I were accidentally given restricted documents. When I was able to finally review the boxes several weeks later, there had been nearly 100 documents removed and replaced with more withdraw sheets. The MDR requests I filed for the missing documents which I could identify are slowly being processed by the agencies. In one strange occurrence, the Office of the Secretary of Defense responded that I should send an MDR request to the Library of Congress, which does not even have the legal authority to declassify documents. Sometimes I cannot help but feel that the agencies who created these documents are trying to entrap me into a “Catch 22,” so they can skirt their legal obligation to make these documents available to the public. So let’s quickly review: President Clinton released a special collection of documents in 1993 and 1994. As Doyle explained in her previous post, the extraordinary collection of documents, already heavily censored, goes through a re-classification process in 1999, reclassifying and making secret hundreds of pages which were once open to the public. Then, at some point since 1994, the collection was split up; the DOS documents are housed at NARA, while the CIA, DIA, and other documents are floating in an obscure, unpublicized, nearly unknown-about collection in the Library of Congress. And the Library of Congress collection is missing hundreds of documents from various agencies. As if that weren’t enough, part of the collection at NARA underwent yet another reclassification process in March of 2010. So why are documents that were released by the president of the United States with pressure from the U.S. Congress in response to a United Nations truth commission missing? Do the CIA, DIA, and U.S. military have something to hide about the massacre of Jesuit priests, a woman, and a child? ← Why did the DOJ Refuse to Release Information on Kurt Waldheim, Nazi, UN General Secretary, and Austrian President? NARA appreciates Ms. Willard bringing this issue to our attention, and we’d like to explain NARA’s best understanding of the status of the records in our custody relating to El Salvador human rights issues. 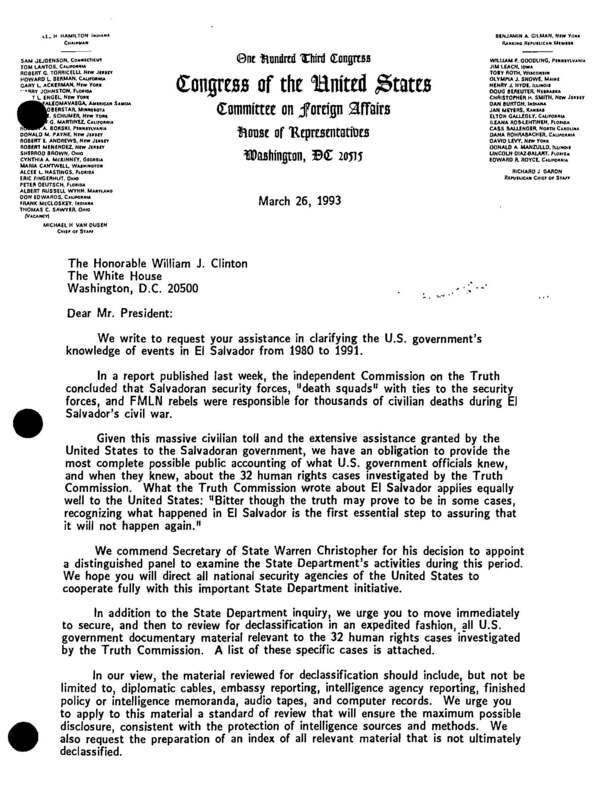 In the first paragraph of her blog, Ms. Willard states that “…related documents released by President Clinton in 1993 have been re-classified…” As explained below, after Ms. Willard’s initial visit, NARA withdrew 31 unclassified documents totaling approximately 100 pages from the files of the UN Truth Commission because they contained sensitive information, including personal privacy and visa information, that had inadvertently been provided to her. No records were “reclassified” as part of this review. The records released by President Clinton in 1993, the special collection pertaining to El Salvador human rights cases were not reviewed and remain open in full. In 1994, NARA received an accession from the State Department identified as the “Special Collection of Records Relating to El Salvador Human Rights Cases, 1979-1993.” This collection of 16.6 cubic feet is the State Department’s portion of the special declassification project, and these records remain open in full for public research, just as from when they arrived. It is these records that were released by President Clinton in 1993 and 1994. The accession dossier for these records includes a letter from the Department of State dated January 10, 1994, stating that the “Special Collection” as transferred by State could be released immediately to the public in full. Separately, in 1996, the State Department’s Office of Central American Affairs initiated the transfer of eight cubic feet of records identified as “UN Truth Commission Files, 1980-1993.” NARA completed the accession in 2000. These records were declassified only in part, and also contained controlled unclassified information (CUI) and were supposed to be screened for personally identifiable information (PII) before being released to researchers. These records are not part of the “Special Collection,” although they may have been the original source for some of the Special Collection files. The records contained withdrawal sheets for the classified documents and Ms. Willard has filed a mandatory review request under the current Executive Order for those classified documents. That request remains pending in our FOIA queue for classified records. On October 9, 2009, Ms. Willard reviewed boxes 12-16 and 37 from the “Special Collection” and boxes 12-15 from the UN Truth Commission Files. (NARA staff was in fact able to locate Ms. Willard’s pull slips at the time, and apologize if Ms. Willard was not made aware of that information. We have located her pull slips again for this response) It appears that NARA research room staff inadvertently provided the boxes from the UN Truth Commission Files to Ms. Willard and her colleague in 2009 without conducting the necessary review for CUI information. When Ms. Willard requested these boxes on March 17, 2010, NARA realized our mistake. David Langbart, a senior archivist with expertise in State Department records, met with Ms. Willard to discuss her request for the Truth Commission records. Mr. Langbart took the issue to Steven D. Tilley, then Director of the Textual Archives Services Division, and one of NARA’s experts on access issues. Mr. Tilley and Mr. Langbart located the pull slips for the Truth Commission records confirming that Ms. Willard had seen the records in 2009. They then examined the records of the Truth Commission and determined that the records contained documents that were tabbed for privacy review. Other documents that contained CUI information were located that were not tabbed. These boxes had “Need Screening” labels on them, but it was not clear when those labels had been applied. It was possible that the labels were applied between Ms. Willard’s first and second visits. Based on this review, Mr. Tilley determined that the boxes needed to be screened for CUI information. Mr. Tilley and Mr. Langbart met with Ms. Willard to explain their findings. She was shown copies of her pull slips and told about the documents in the files that needed to be removed. Since we had confirmed that she had seen the records in 2009, we informed her that we would have the boxes screened on a priority basis. Ms. Willard seemed to understand the situation. A member of our Special Access and FOIA Branch immediately began to screen the records. As mentioned above, some documents had privacy tabs that had been placed in the boxes before the boxes were served to Archive personnel in 2009. We decided to expand our review beyond those tabbed documents to insure that all sensitive information was located and withdrawn. Since this was a screening review and not a review under the FOIA, entire documents were withdrawn if they contained sensitive information and no line-by-line review was performed. The review resulted in 31 documents totaling 87 unique pages being withdrawn in full. If duplicate documents are included, approximately 100 pages were withdrawn. The withdrawn documents contained several types of CUI that must be redacted from the documents, including the names of several FB I special agents and one special agent of the Drug Enforcement Administration, home addresses, home phone numbers, visa information, and the identity of a foreign national whom the State Department requested to be protected as a confidential informant. The FBI was concerned about the identity of one agent whose participation was being sought in the trial of a Salvadoran national in El Salvador. After the screening of the records was completed, the boxes were made available to Ms. Willard on April 8, 2010, three weeks and one day after her request was made on March 17th. She subsequently filed a FOIA request for the withdrawn documents. NARA recognizes that we should have conducted an expedited review as soon as we became aware of the inadvertent disclosure, which we are now doing in response to her FOIA request. When completed, the documents will be released with a minimal amount of information withheld. As a final note, because the “Special Collection” was an amalgam of declassified records from numerous agencies, the collection as a whole was never accessioned into the National Archives. NARA appears to have officially received only the State Department’s portion; the CIA and DOD may transfer their portions at some future time. (The Chile/Pinochet and Argentina Human Rights Special Collections were also not accessioned into the National Archives.) Accordingly, there does not appear to be any central repository for a complete set of these special collections of declassified records. If there are future such collections, NARA will make efforts to obtain and preserve a complete set, and NARA will explore whether a full set of the El Salvador Special Collection can be re-constituted. Thank you for your response Mr. Kurtz. Added your web site. Appreciation for giving. Surely value time clear of our studies.